Soup or Salad? So confusing! 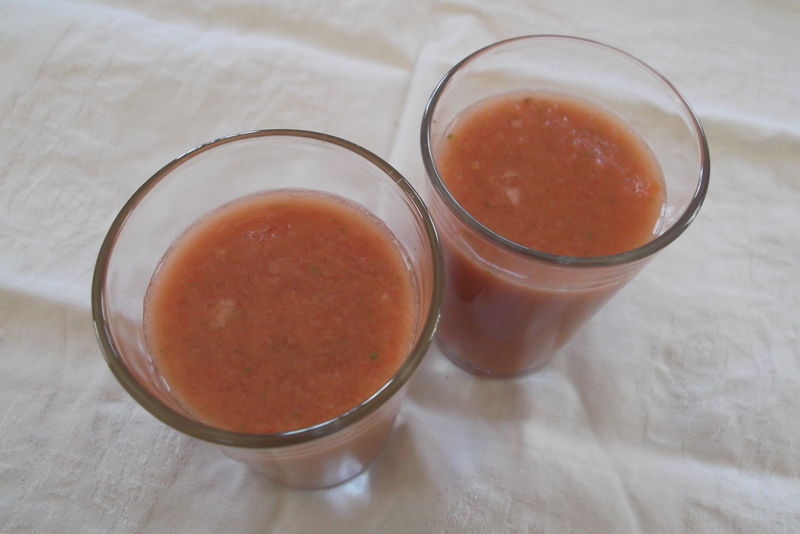 Ok, so I say the word Gazpacho, and what do you think of? 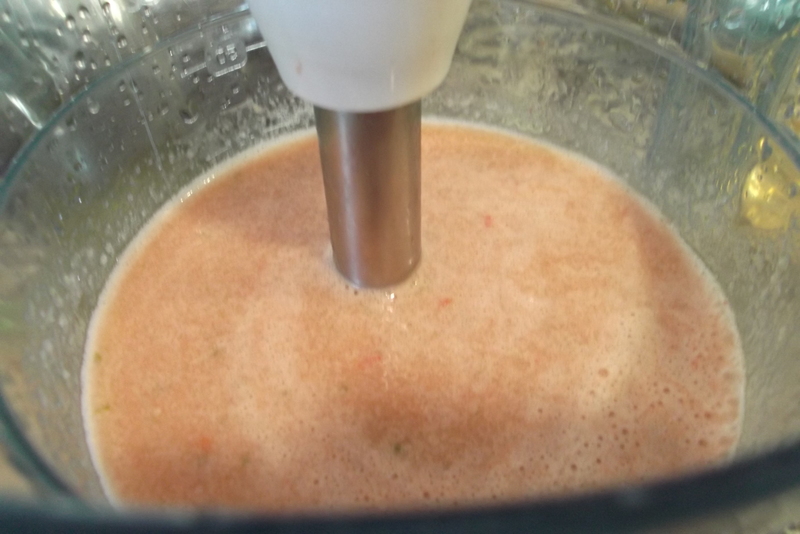 A bowl of a chilled tomato based soup, with chopped pepper, cucumber and possibly more tomato floating on top? I´m right, aren´t I?! Ok, so enough with the questions. You´d be right of course. But you´d also be wrong. 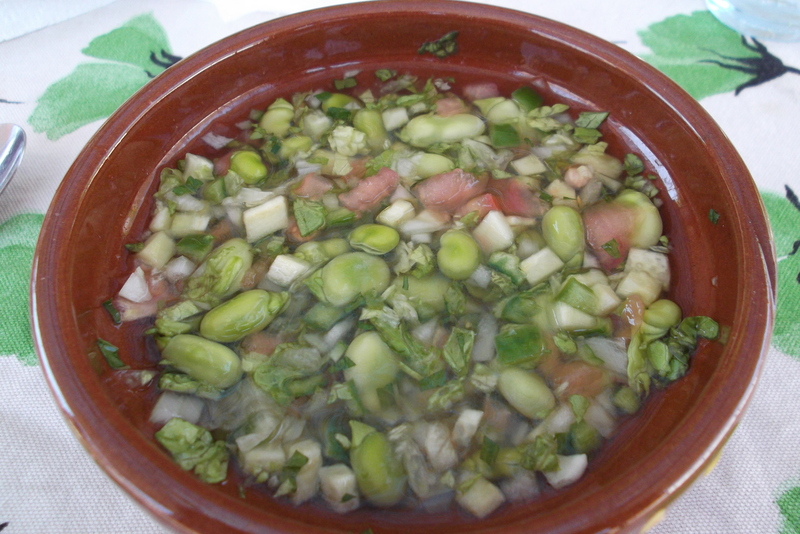 Well, not wrong exactly, just probably not aware of the different versions of Gazpacho that exist in Andalucía. 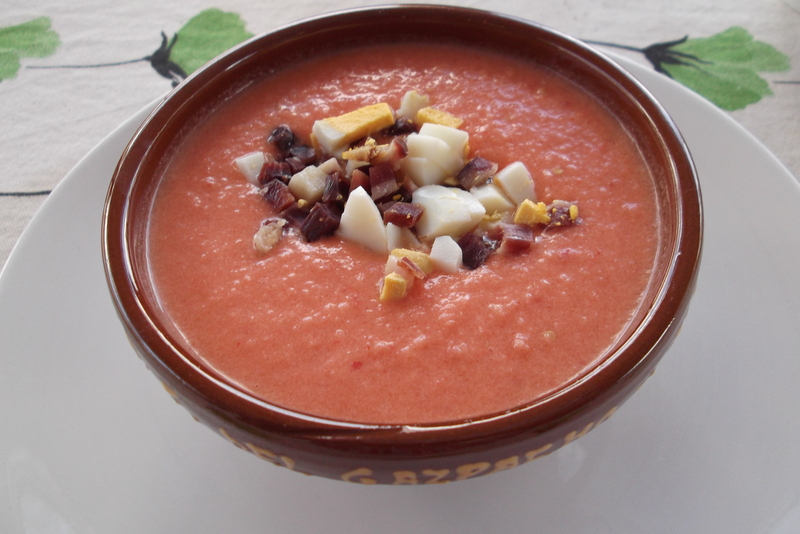 Gazpacho is Andaluz (i.e. 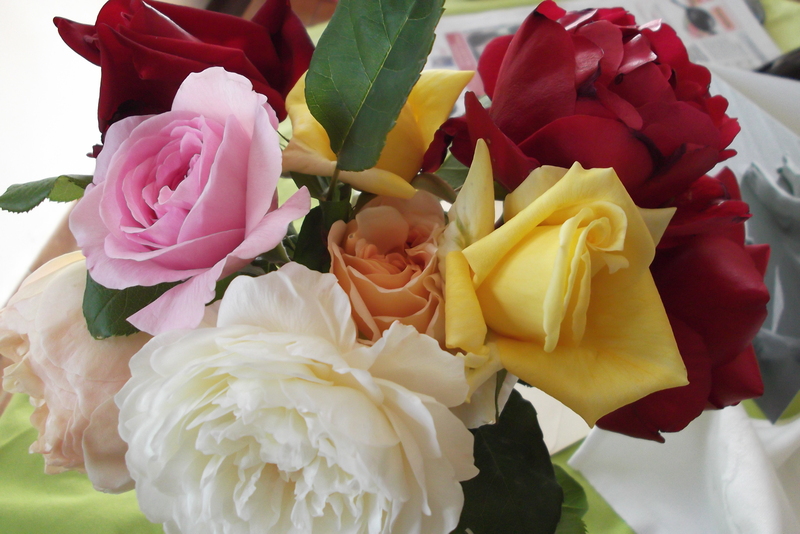 from the Andalucían region of Spain) rather than Spanish. Just as Paella is Valencian and not Spanish. It´s all getting complicated, so maybe I should start at the beginning. Andalucía has always traditionally been more reliant on agriculture (farming, olives, goats and pigs) than industry. Based on hard labour through grafting on the land, or the “campo”. So what did those hungry labourers do at midday, apart from take a well deserved rest in the shade of an olive tree, that is? Well, they took their lunch, or the makings of it, with them. Life was, and still is, fairly tough for a lot of people. 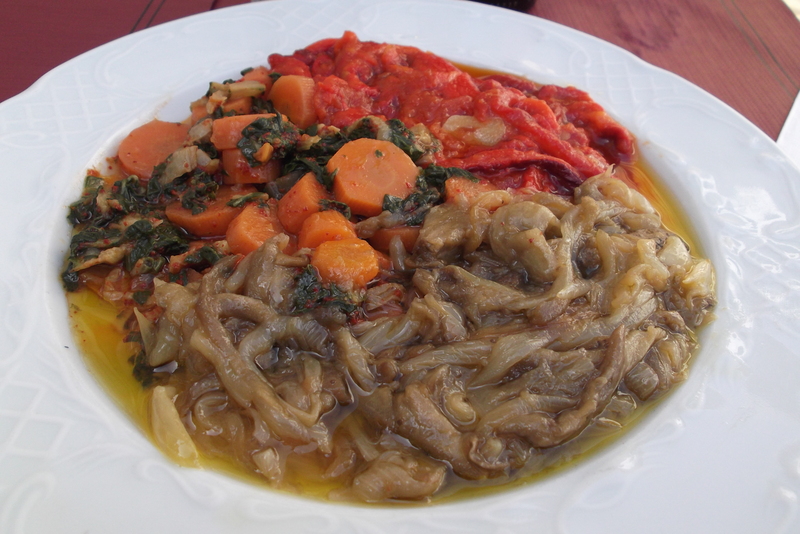 Poverty reigned and many of the traditional dishes came about through necessity. 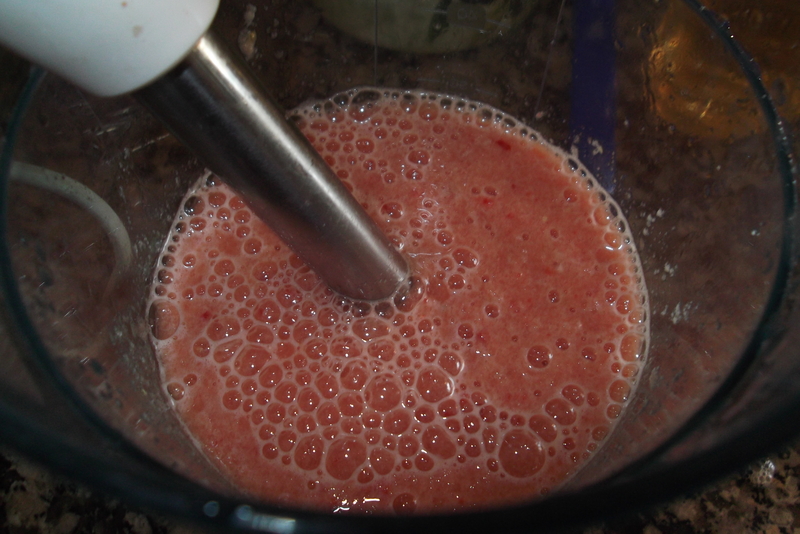 Ask any older person here what the key ingredients of a gazpacho are and they´ll tell you “water, vinegar and salt”. And it´s true, they go into all the versions. The reason for this was to make you thirsty. And therefore drink more water, and thus feel full up. Your belly was full of liquid and stopped you craving more food. So, we have our country men with a twist of salt, a bottle of vinegar and a knife. 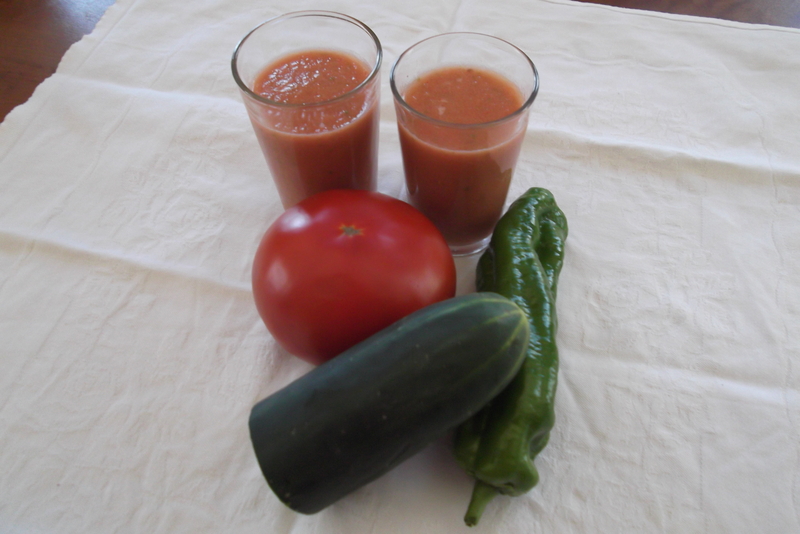 Water came courtesy of a nearby stream, and the vegetables that went into their gazpacho were those that could be found in the countryside around them. 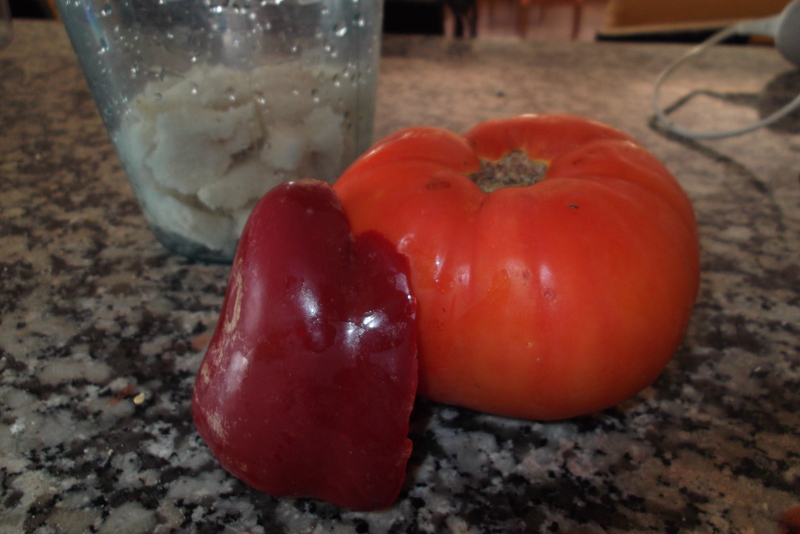 Sometimes tomatoes, peppers, onions. Other times wild leaves, oranges or a melon. 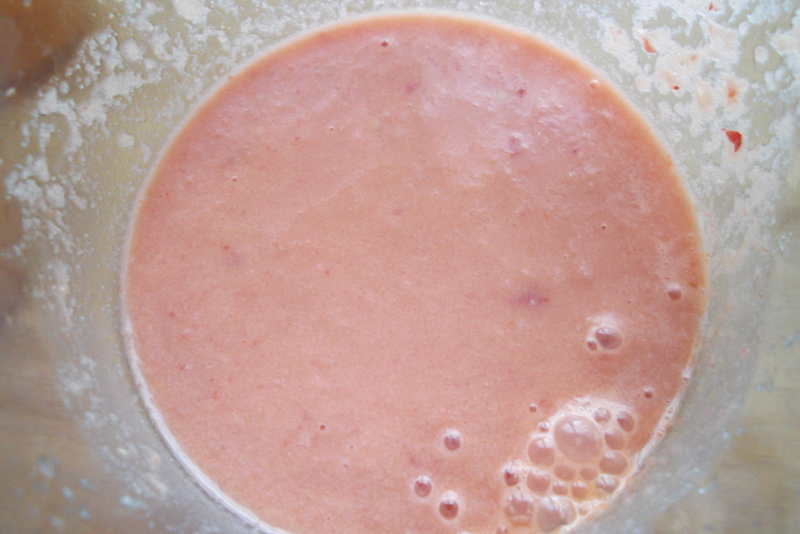 The gazpacho you see above looks, and actually tastes, like a very finely chopped salad in a bowl of iced water. I won´t lie to you, that´s pretty much what it is! When I first came here, I admit that I didn´t really “get” it. Now that time has passed and I´ve endured quite a few very hot summers, it all makes sense. A chilled bowl of iced salad/soup, with a little tickle of salt and vinegar, the tang of fresh mint and the crunch of all my favourite summer vegetables goes down a treat when you can´t face doing anything more energetic than swatting a fly away and adjusting your sombrero. Our village prizes this version of Gazpacho so much that it has a three day Fiesta Del Gazpacho dedicated to it every first weekend in August! All good fun, although we tend to slake our thirst afterwards with a cold beer or a few glasses of wine. And then, when we´ve cooled down, we all take to the dance floor and Paso Doble until dawn. Happy days. 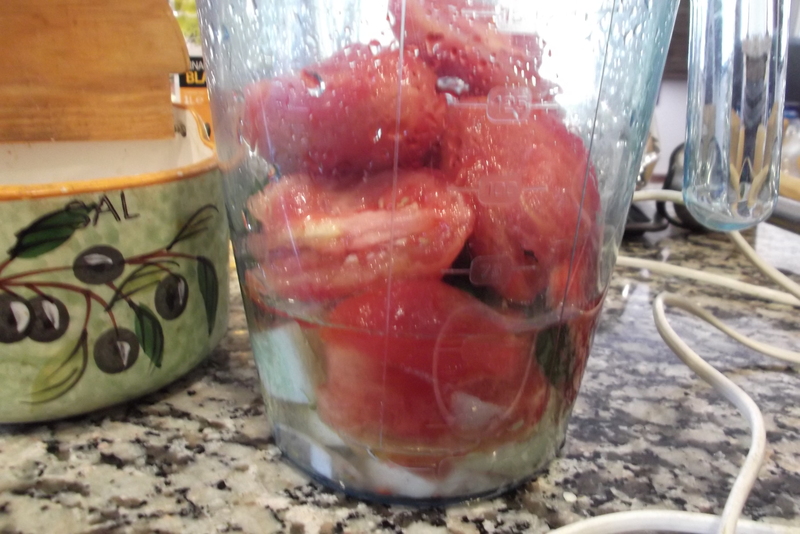 Mix all the salad ingredients in a large bowl and pour over water so that the vegetables are just covered. 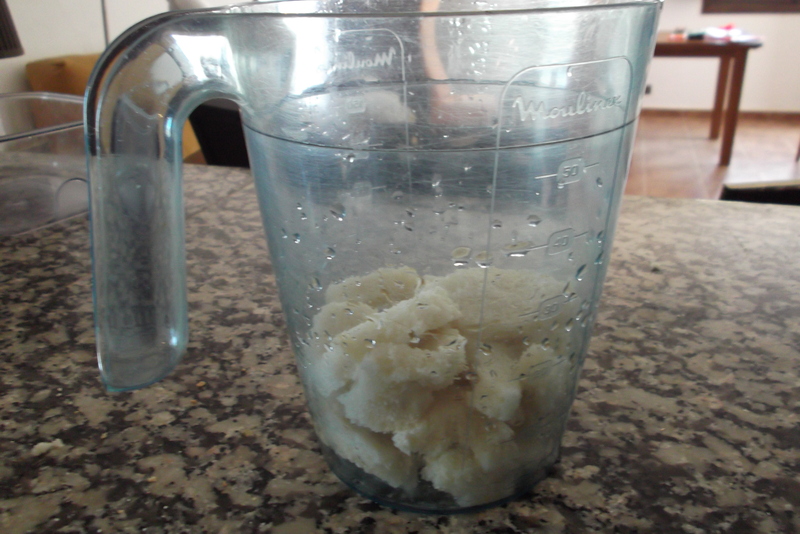 Gradually start to add salt and vinegar to taste (they tend to use a lot of both here, but go steady until you get a flavour you like). The locals say it should taste “alegre” which is happy or lively! 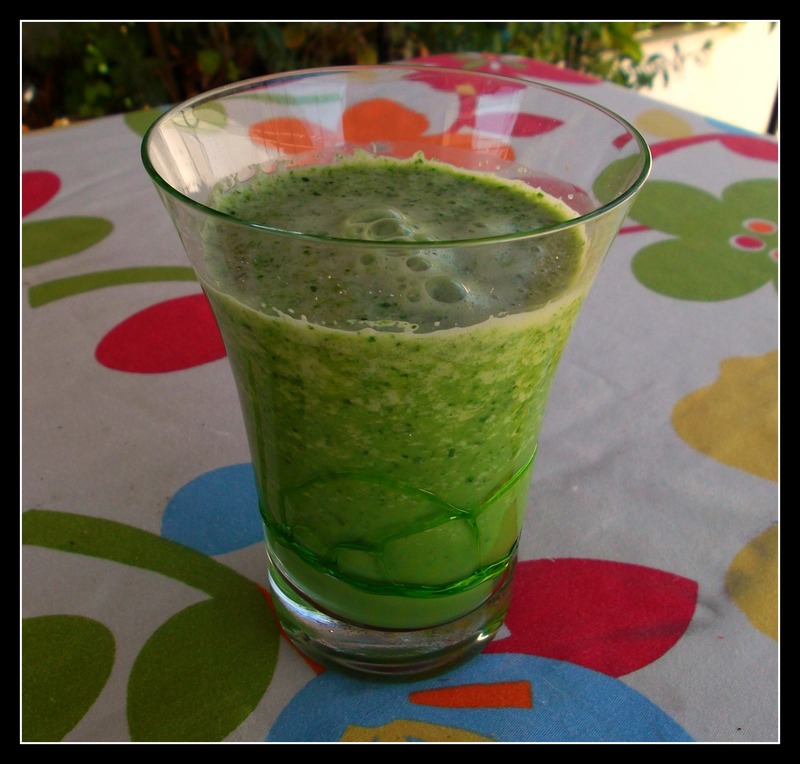 Add a few ice cubes and leave for at least half an hour so that the mint really infuses the water, then ladle into bowls, lower yourself onto a comfy chair in the shade of an olive tree, tilt your sombrero over your eyes and enjoy. Now, I am very much of the opinion that birthdays are to be celebrated. Whether you´re 4, 24, or 94….life is a wonderful celebration and what better than to mark the start of a new year in your life than with a little something special. Big Man came from a very large family, and once he and his siblings had gone beyond the age of celebrating with a small cake and a cup of hot chocolate all round, birthday celebrations became a thing of the past. Then he met a crazy English/Italian woman who wanted to live in Spain with him, and who loved to mark an occasion with a bottle of something and a cake. The poor dogs were “christened” so many times that they began to get over excited every time we opened a bottle of Cava. Yesterday we took a day out for ourselves and went to visit a town I had not previously been to. 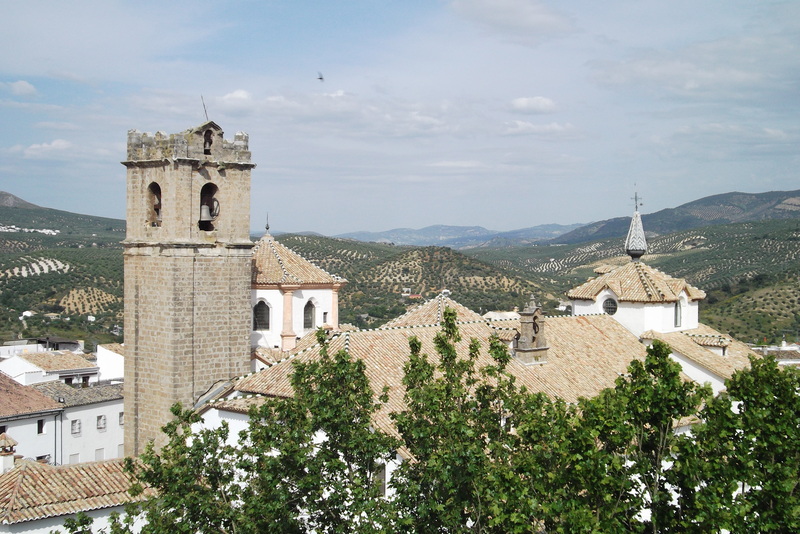 About 100km away from us (albeit by some very twisty mountain roads) lies the beautiful Baroque town of Priego De Cordoba. The day was hot and humid. This was unexpected as we had dressed for cooler weather. 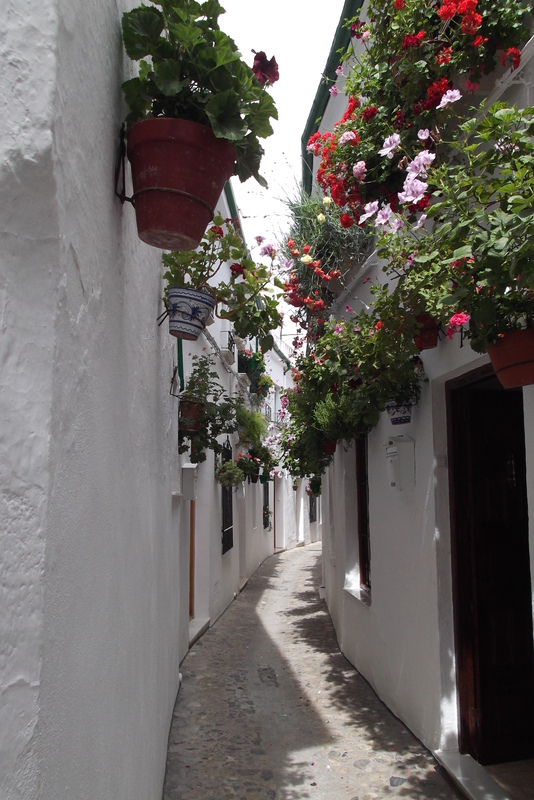 First we had a wander through the little alleys of the old town. 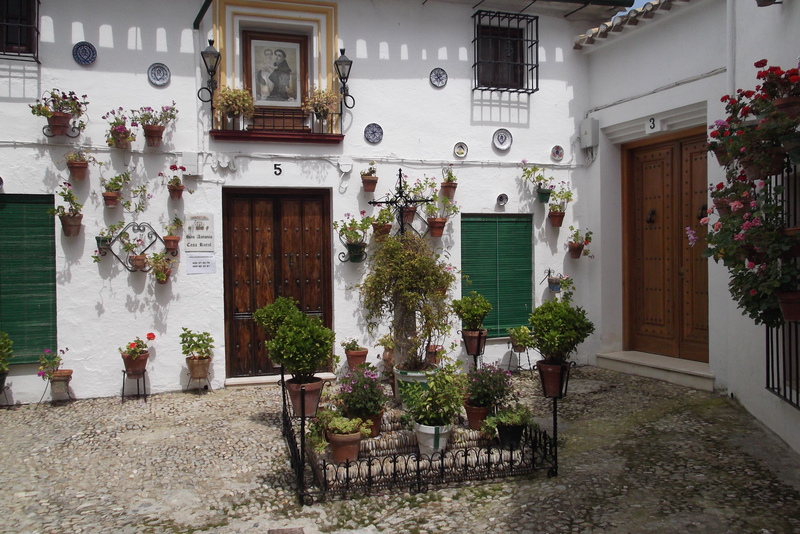 For me, geraniums are the typical flowers of the Mediterranean and the people of the Province of Cordoba are rightly very proud of their patios and displays of flowers. When the heat became too much we retired to the courtyard of a restaurant in the shadow of the old castle. 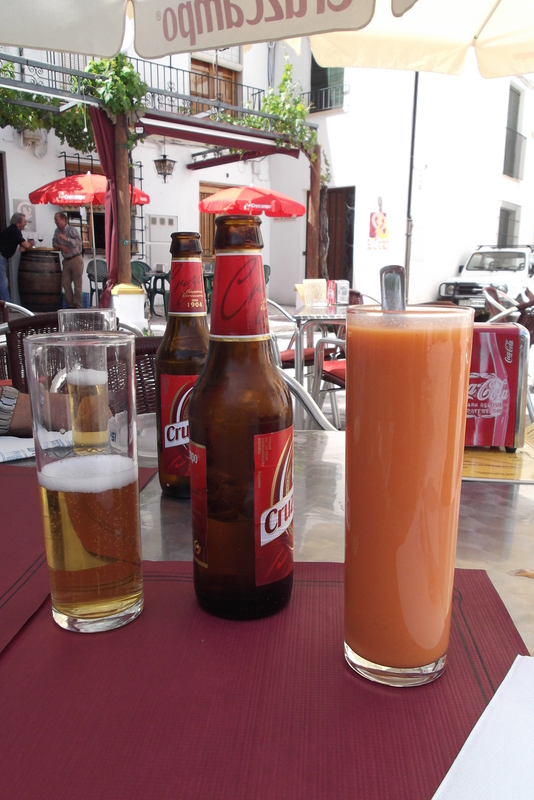 While we tried to make our minds up over what to eat we dithered over ordering a cold beer or a glass of Gazpacho to quench our thirst. Oh well, “just order both” we thought, and what a great idea that was. Cold glasses of wine followed with an amazing starter which was called “Sephardic Salad” on the menu. 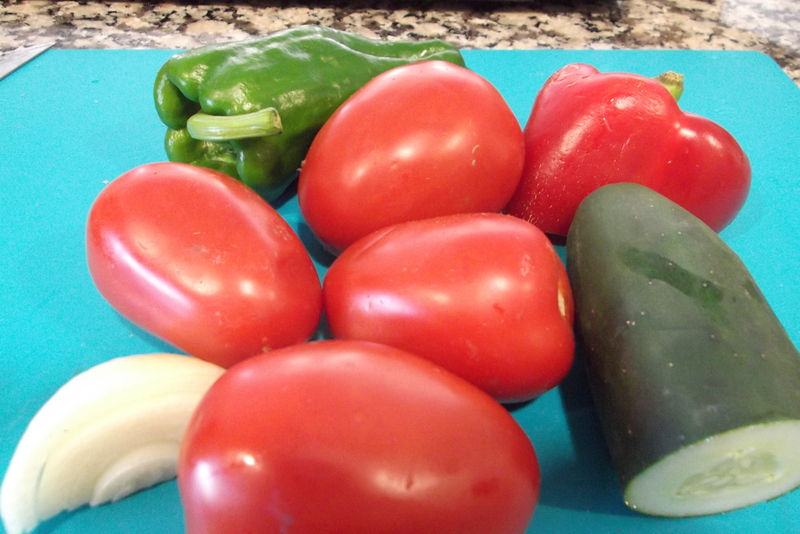 It consisted of a selection of vegetables slowly braised in olive oil and garlic and served cold with lots of bread and small local twisted breadsticks to dip and dunk. 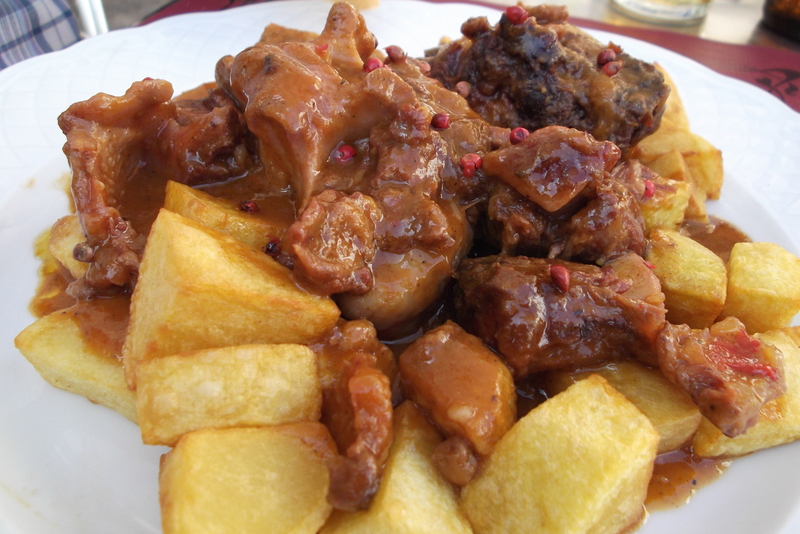 Main course was Rabo de Toro, or oxtail cooked slowly with pink peppercorns and served with sauté potatoes. Delicious. 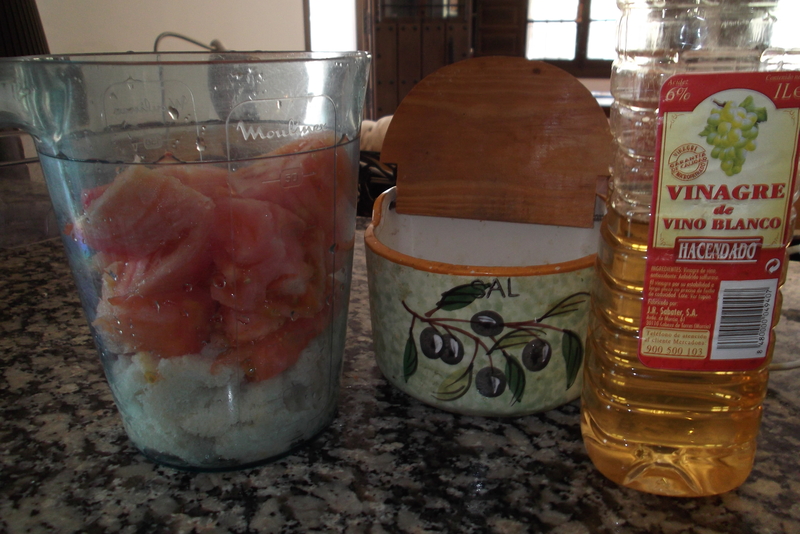 When I can figure out how to do it I´ll add a link to my recipe for this. Sorry, I´ve tried but can´t seem to work it out! 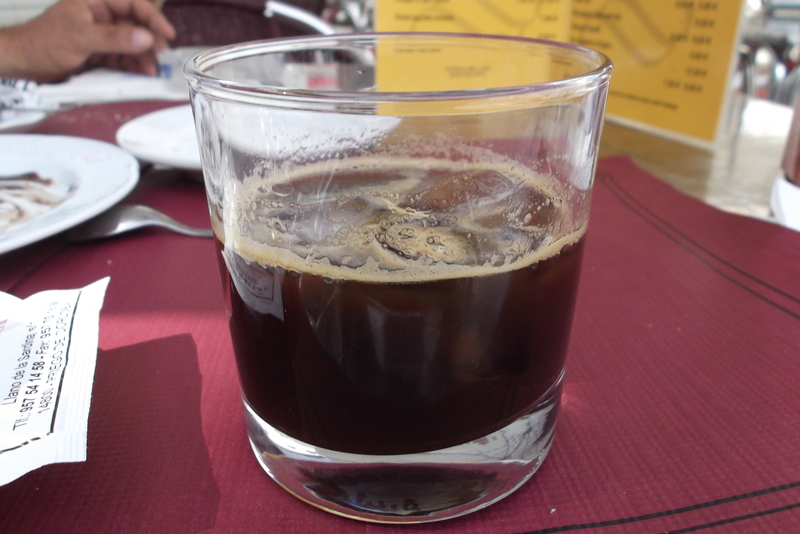 We were too full for pudding but ordered strong coffees with a separate glass of ice. You add sugar to your hot coffee if you take it, then pour the coffee over the ice and wait a moment for it to chill your coffee. Perfect. Suitably refreshed we headed into the castle and I overcame my fear of heights to climb to the top of the tower for some beautiful views of the city. Then we headed back through the old streets to what used to be the “Royal Butchers and Slaughterhouse”. 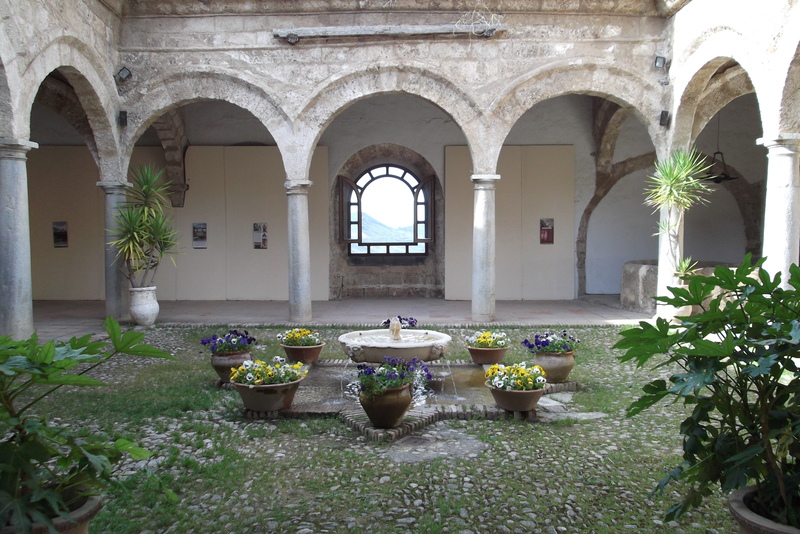 Sounds grisly, but it was a beautiful, shady patio with a fountain bubbling away in the centre of a columned courtyard. We stopped a while and just soaked up the atmosphere. Big Man agreed that birthdays are most definitely for celebrating, it was a very special day.